Fuzzies: Small aboriginal creatures of the planet Zarathustra which first appeared in the novel Little Fuzzy, by H. Beam Piper. They are known as Gashta in their own language, and stand about two feet tall. Fuzzies made their RPG debut in Ultima III: Exodus. For some reason, I seem to remember that they were in Wizardry as well, but I may be mistaken about that - it's been a long time since I played either game. 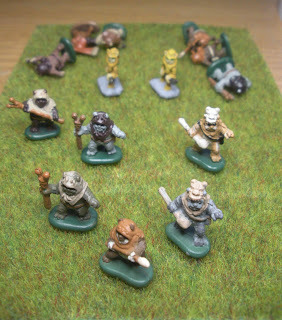 Fuzzies armed with their traditional weapons, as well as with blasters were made by Archive miniatures as part of their Star Rovers line. Below are a pair of Fuzzies with their hodda. 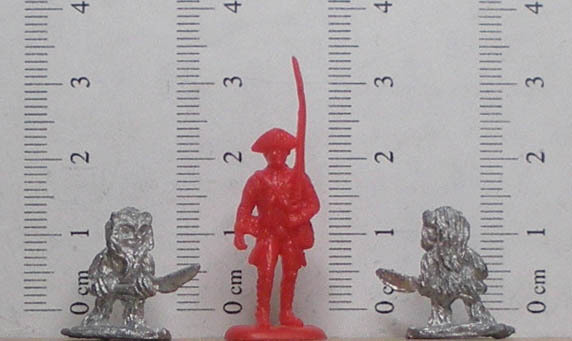 They stand about 15mm high, so are actually about foot and a half taller than a Fuzzy should be (in 1/72 scale). Ewoks: Shameless products for merchandising, or symbols of the triumph of resourcefulness over technology? 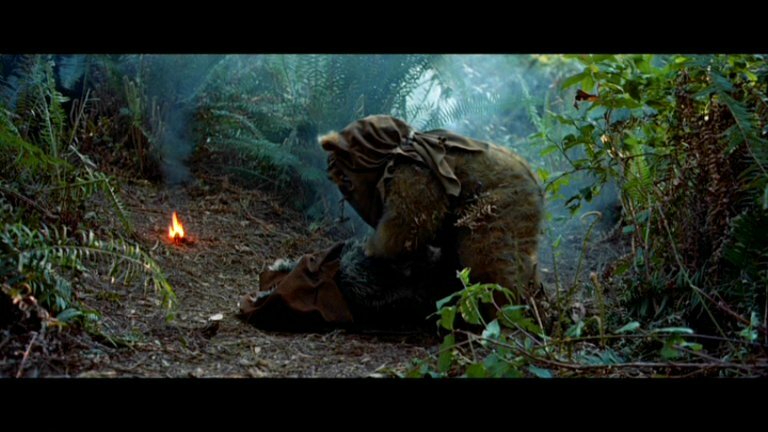 I was neutral about Ewoks when I first saw Jedi, but always thought that the Battle of Endor was rather ridiculous. 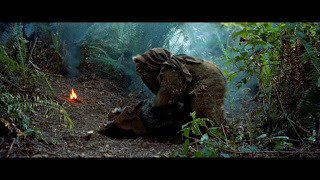 If they were consistently portrayed as primitive man-eating (why do people keep saying Ewoks are cannibalistic?) savages, they would have worked for me, but unfortunately they were flanderized with respect to their "cute" characteristics, and I've developed somewhat of a bias against them. Galoob made a number of Ewoks as part of their MicroMachines Star Wars line. The first four poses (starting from the left) come from the Ewoks figure set (66080), while the last two poses are unique to playsets. 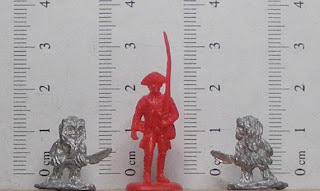 They stand about 15mm high, and come painted in typical MicroMachines fashion. So who would win in a fight? Me, I'm partial to the Fuzzies. ...and to hear the lamentation of their women. Fine post - I don't really like Ewoks either, they were the 1980's equivalent of Jam Jar Banks! 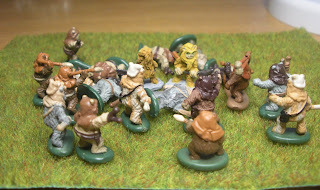 I'm intrigued to know someone put Fuzzies into war-games and made figures, I read the Fuzzy Papers an age ago and took a liking to them then! Mine was a blast to play and had an ego as big as he was small. For all the wise cracks about "pâté de foie Fuzzee", he was the toughest 11th mage you ever met. My friends made the inevitable comparisons between Fuzzies and Ewoks, but, as far as I was concerned, Ewoks were just Dwarves in Wookie suits. Is there a repository or list of links somewhere to Fuzzy art? I need an image from above in the stile of the Ace cover. 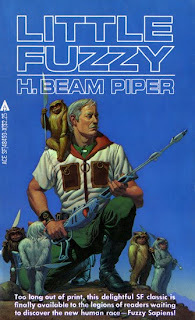 A Google search should turn up lots of pictures, but for official art, you might want to try the H. Beam Piper Home Page.